Hannah Richell’s debut, Secrets of the Tides, was a keeper for me. I subscribed to Hannah’s posts so when I saw that The Shadow Year was coming out I was VERY excited! We begin with an ‘otherworldly’ prologue. It’s very dreamlike. I wanted to know who it was out on the lake and why didn’t she know if she was awake or dreaming? In July, Lila is in the park. It’s that time of day when there’s a lull – after lunch but before the children come out of school. It’s obvious from this scene that Lila has suffered a loss of her own because of her emotional pain and her ‘almost’ actions. We can guess why but we have no idea about the physical pain. She arrives home to find a courier at her door … an anonymous gift of a key and a plot of land. Having lost her father she wonders if the inheritance is something to do with him. 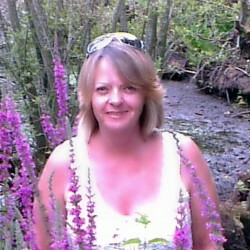 The relationship with her husband Tom is strained, with a definite barrier between them. Chapter Two we’re with Kat, Ben, Carla, Simon and Mac. Graduates, their time as students is almost at an end. It’s very hot and they want to do something tomorrow. It’s very obvious that Simon is the leader of the group! Mac takes them to a lake the next day and they decide to live off the land at Simon’s suggestion – living in a tumbledown cottage. As the plot unfolds, I had my suspicions and was able to make links and predictions. There was one thing I hadn’t worked out but it became clear as I followed Freya on one of her solitary jaunts exactly how it tied in. The pace of the plot and the writing style are perfect for the unfolding truths. I love the way the story becomes a cohesive whole. The group living off the land is authentic with the rhythms and the pace of the seasons. I have to be honest and say that The Shadow Year grabbed me from the beginning. In fact I even dreamt about the group, the story carrying on in my subconscious while I was asleep. Even when out dog walking the dynamics of the group and Lila’s life were in my thoughts. Once again, Richell uses her characters to look into the deepest and darkest places in our souls. The place where we usually feel the least comfortable. 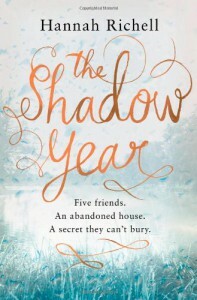 The Shadow Year is a story about wanting to belong and being prepared to do anything to keep that place … and the effect that has on future lives. It’s about childhood parenting and the effect that has in believing in yourself. It shows how even in our deepest despair, there is a future of brightness and joy. I would like to thank Hannah for sending me the Australian paperback version. My review is honest.